A graduate of the College of Charleston in Charleston, South Carolina, with a bachelor’s degree in biology, Frank O. Pusey Jr., MD, earned his medical degree from the Medical University of South Carolina in Charleston. He completed his neurology residency at MUSC as well. Dr. Pusey is board certified by the American Board of Psychiatry and Neurology and is a member of the American Academy of Neurology. He previously served on the South Carolina Stroke Task Force and as chair of Operation Stroke for the Midlands chapter of the American Stroke Association. He has also served for 10 years on the Stroke Committee at Lexington Medical Center in West Columbia, South Carolina. 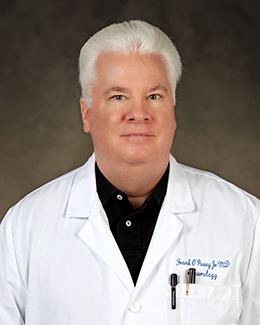 Prior to joining this hospital’s network of care, Dr. Pusey worked in private practice. He has nearly 30 years of experience treating general neurological disorders, including nervous system inflammatory diseases, Alzheimer’s disease, migraines, seizures and Parkinson’s disease. Dr. Pusey joined the board-certified physicians at Southeastern Neurology & Memory Clinic to provide comprehensive neurological care to inpatients at Lexington Medical Center, including evaluating, monitoring, preventing and treating a variety of cognitive disorders.